What do you do when you don’t have Microsoft Office installed on your pc and you want to view an office document urgently? Unfortunately you don’t even have installation CD but luckily you have internet. Well, we all know that internet has almost every info we need. But can you open documents online? Yeah! You can! 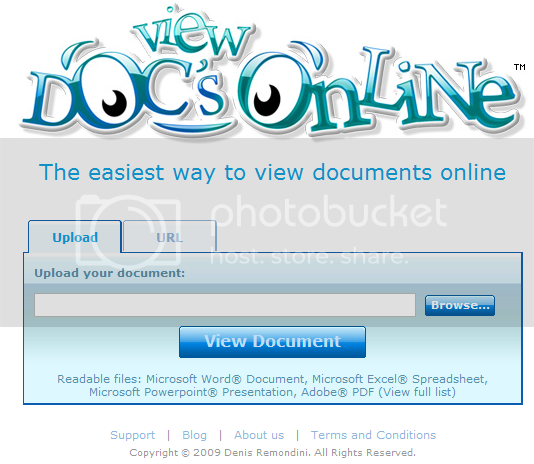 There’s a web based service known as Viewdocsonline which allows you to open Microsoft Office doc, docx, ppt, pptx, pps, xls, xlsx, open office formats (odt, odp, sxw, sxi), PDF formats (PDF, ps) and text formats (txt, rtf) as well. To view any one of the above mentioned documents online go to viewdocsonline and upload the file, once the file is uploaded you can open and view it in your web browser itself. I liked this service for two main reasons. Firstly, you don’t need to install any application to view documents. Secondly, your friends and relatives can view them online itself.